Here is a solution to add columns to a list of an M3 panel in Smart Office without doing any M3 Java modifications and without writing any scripts. The advantage is zero programming. In addition, this technique is interesting when it’s not possible to create custom Sorting Orders (QTTP) nor custom Views (PAVR) for an M3 program (for example Stock Location – MMS010). This technique uses a new feature of M3 called Custom Lists. 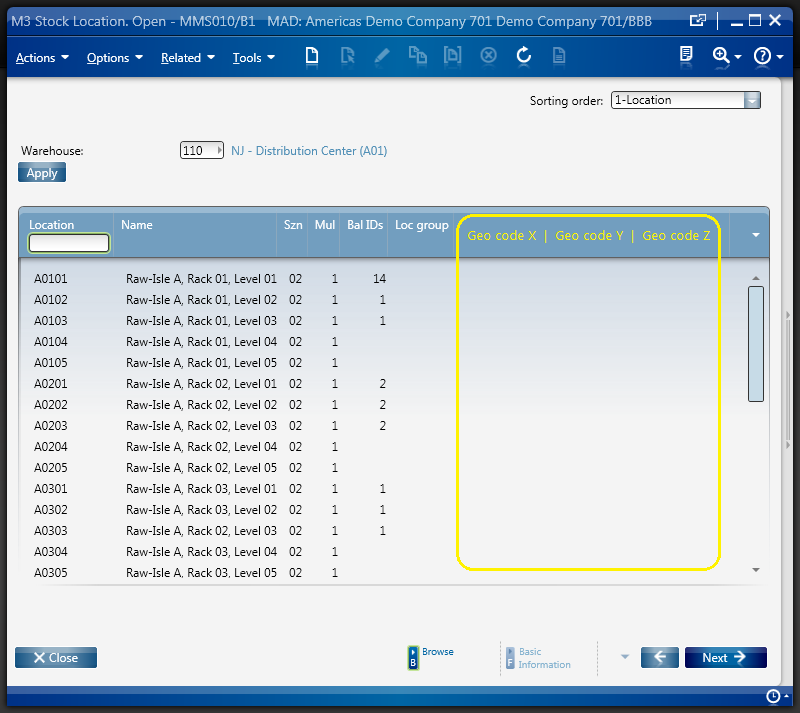 To create custom lists you will need the Industry Enrichment Package IEP F09201M306 in MNS096. 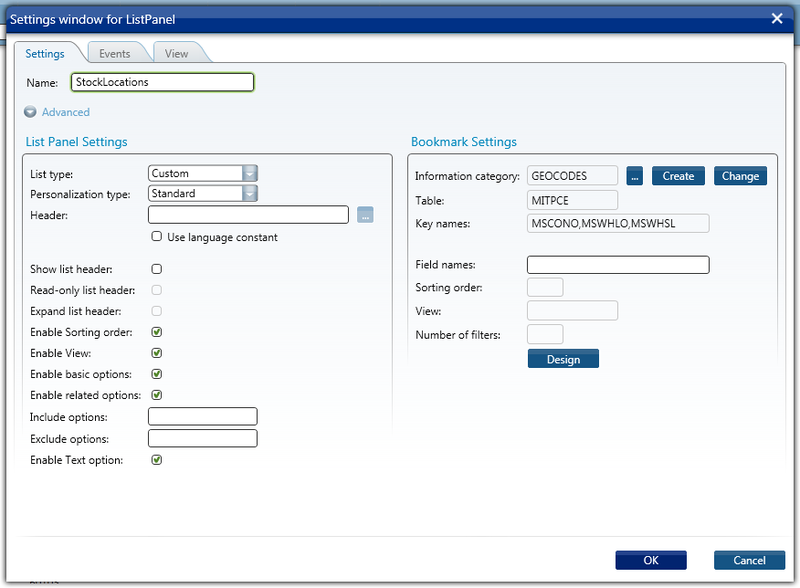 In this example I will add three columns Geo code X, Y, and Z to the list of Stock Location – MMS010/B1. The values come from the fields GEOX, GEOY, and GEOZ of MMS010/F. This solution is an alternative to the solution of my previous post where I illustrated how to programmatically add columns to a list by writing a script. 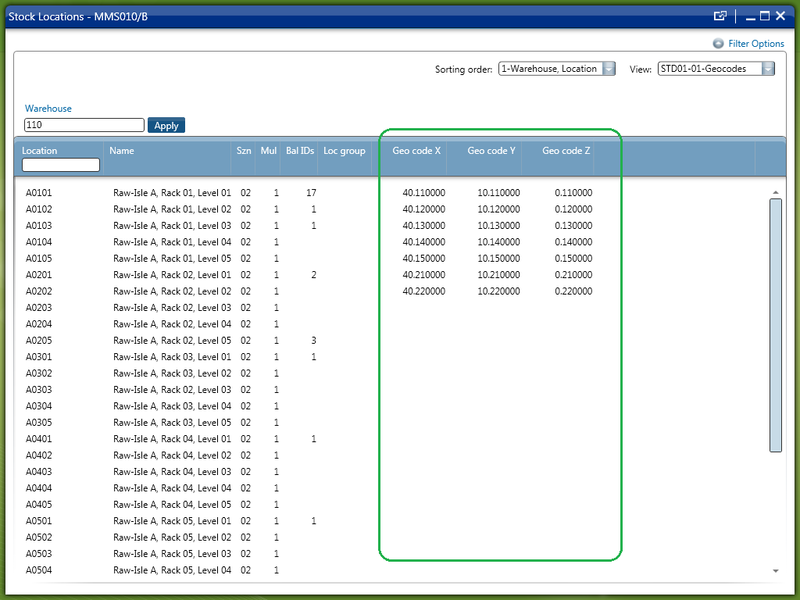 The desired result is the list Stock Location – MMS010/B1 with three new columns Geo code X, Y, and Z. 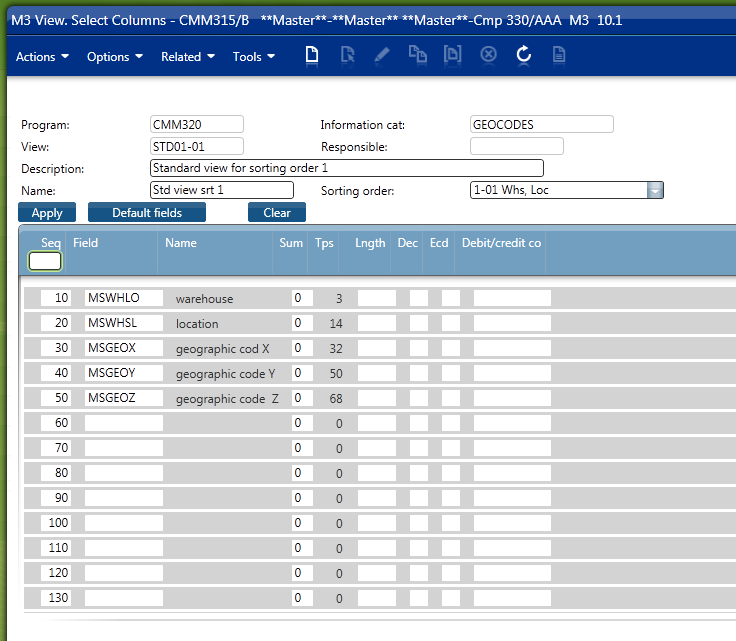 The final result is a Mashup with Stock Location – MMS010 and three new columns Geo code X, Y, and X. 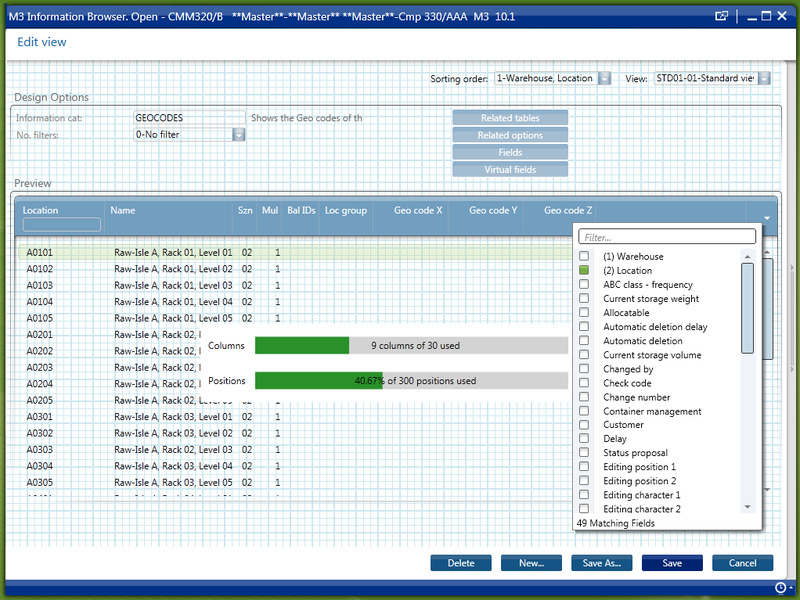 With the new IEP feature and with Mashups we can now create Custom Lists in M3 by configuration only, i.e. without any programming. To learn this technique and more, refer to the Mashup Designer Advanced training (code SMMA2) from the Lawson Learning courses. Hi Angela! Glad you like it. Thanks for the feedback. Thank you Thibaud. Your post are always extremely valuable. In your personal opinion, which way is better safer; do your think writing JScript to add column to panel versus adding columns through CMM310. What happens if “normal” user has access to CMM310 and changes Information Category, will Mashup completely break or just where being referenced? Lets say a JScript is written, will the added columns be viewed in the Mashup if XAML is referencing the M3 panel? If we do a modification in CMM310 is there a way to easily push to other environments like (DEV, TST, EDU, STG, PRD)? 1) I strongly recommend using Custom Lists with CMM310 as opposed to writing a script. The reason is the script coding nightmare (see my other post with the script). 2) I don’t see a risk with the user changing CMM310. If that happens then yes, likely the Mashup won’t display what it should anymore, just like if the user changed something somewhere else. 3) Yes, you can combine Mashups + CMM310 + Scripts. 4) I think you will have to re-configure CMM310 in the other environments. Not ideal. UPDATE 2014-01-24: With the new version of M3, CMM310 has been deprecated and replaced by CMS010. problem is I can’t use OOLINE21 index, have any way to do above scenario, is it handle using selected sorting order in custom list designing. Hi Priyantha, I read your description and I don’t know the answer. I would have to check. I find Custom Lists tricky to setup, and I don’t think they’re guaranteed to always work; it’s like the M3 Web Services where you only know once you try. For your question, ask an M3 MAK developer around you so they can dig into what’s happening. Apologies for the necro post, but I’m a keen reader of your blogs and find your posts a gold mine of information when it comes to M3 and leveraging some of the exciting new tools and functionality of Smart Office. I’d come across your post on the Custom List designer before and it had prompted me to push for our M3 admins to get the Enrichment Package installed as there I could see a lot of potential in some of the tools. We’ve found that after installing the Custom List Designer functionality that we were unable to create a Custom List in the Mashup Designer, on further investigation with Infor it was found that this was due to an error where M3 fails to parse the version number from the BE version string – 14.1.2.MCP1-1412-01, it’s a know error which they’ve yet to develop a fix for unfortunately and related to a fix we had recently taken. Short of changing the code in the program cBEVersion via MAK, another workaround that we considered might work would be to create the Custom List in CMM310 (which we’ve done) then just manually insert the information into the Xaml code. I was just wondering if you might have an example of the what the Xaml of a custom list would look like, as I’m struggling a little bit with the parameters and layout of the code for the Custom List to put into the Mashup. For test purposes I actually recreated your MMS010 GEOCODES example in CMM310 initially, when we couldn’t get the Custom List to work in the Mashup designe, just to make sure the issue wasn’t anything to do with how we set up the Information Browse or anything. So parameters of our test Mashup is basically the same as you had previously done. Thanks very much in advance and looking forward to reading what 2016 brings! That’s fantastic, thank you very much for the example, I can see exactly where I was going wrong before, I was very close but just had to change a couple of things. Thanks again for the assistance, it’s very much appreciated! Hi, is it possible to insert checkbox inside the list panel? Hi Len. If you build your own list in XAML then yes you can insert a checkbox and anything you want. If you use the built-in M3 ListView then not because it is generated by Smart Office, unless you develop a script with which everything is possible. if I use jscript. I should add it to the panel’s personalization for it to be included in the mashup? But if that is the case, then the check box will also appear in the panel, am I correct? I just want the textbox to show in mashup, not in the actual program panel. And I’m using M3 list panel. I am not clear on what you are trying to do. M3 lists are rendered automatically and you cannot control them, unless you develop a script that finds its way to the list and modifies it. If you build your own WPF list in XAML then you have full control of it since you’re the author. The result will be whatever you choose it to be.